This book was provided by the author in exchange for a review. I seem to be stuck in a pattern of reading books about WWII lately. Partly this is due the the fact that books about the war seem to be the current trend in historical fiction, but it is also due to the fact that there happen to be a lot of excellent books out there right now that deal with the war. I, myself, have read and reviewed several of them lately, like Chris Bohjalian's A Light in the Ruins and Nancy Kricorian's All the Light There Was. The best of this list so far, though, is The Baker's Daughter by Sarah McCoy. The Baker's Daughter is really a story within a story. In the set-up story Reba Allen, a writer for a local magazine in El Paso, Texas, is assigned to write a fluff piece about the Christmas customs of the various cultures that make up the melting pot that is El Paso. In pursuit of this, she decides to interview Elsie Schmidt, a German immigrant and owner of Elsie's German Bakerie. Thus the reader is introduced to the second story of the book, that of Elsie Schmidt and her family during the waning years of the Second World War. It is the similarities and contrasts between the two stories that pulls this book together as a cohesive whole. Although both stories are well told and interesting, the story of Elsie and her family was by far my favorite of the two stories. I was captivated by both the character of Elsie and her story from the page that they were introduced all the way to their end. I especially liked reading a story from the perspective of a typical German family during the war. I though the author did an excellent job of using Elsie, her family, and those around them to show that there were Germans of all types during the war. Like everyone else, they had their good and their bad,, were confused and conflicted, and missed the normalcy of their everyday lives. It was their utter humanness that drew me into the story and kept me going. I also loved the way that the author used the stories of Reba and her fiancee Riki to echo the themes of confused emotions and conflicted ideals that we saw in Elsie's story. Perhaps this quote sums it up the best, "No one is good or bad by birth or nation or religion. Inside, we are all masters and slaves, rich and poor, perfect and flawed." To say that this book was beautifully written is an understatement. Sarah McCoy is a master at telling a story with beautiful prose and wonderful emotion. Her descriptions were so well done that I could actually smell the baking bread, taste the rolls hot from the oven, and feel the cold of the snow. In addition, I could feel the emotions of fear, happiness, despair, and longing that she described. In addition, the inclusion of the letters from and to the characters really helped to highlight the personal aspects of the story. This book truly encompasses the best in historical fiction, taking you into the lives and times of the characters and settings and making you feel like you are right there with them. As you can tell, I loved this book. The only thing that I saw as a drawback was the size of the font. I know, that is a weird thing to comment on, but the font in this book was so small that I found it really hard to read unless I was in bright light. The letters, especially, were hard to read at times. In this case, a cursive font was used to make the letters seem more real, which is actually a plus, but again, the font was so small that it was hard to make out some of the cursive writing. At any rate, this was the only thing that marred my otherwise perfect experience with this book, and I am probably making it sound more important than it was. I have seen and looked at Sarah McCoy's other book, The Time it Snowed in Puerto Rico, but have never quite decided to read it. 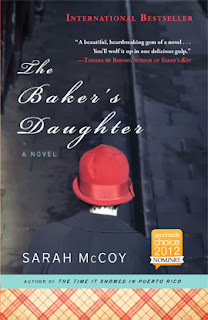 After reading The Baker's Daughter, though, I am excited to read it. I believe that Sarah is going to become one of my favorite authors in no time. I highly recommend this book for lovers of historical fiction, especially those interested in reading about every day lives during WWII.